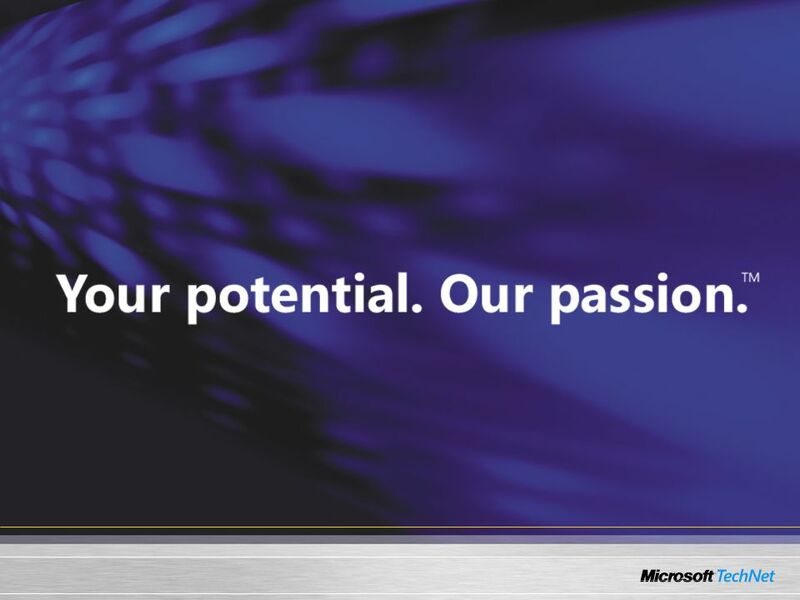 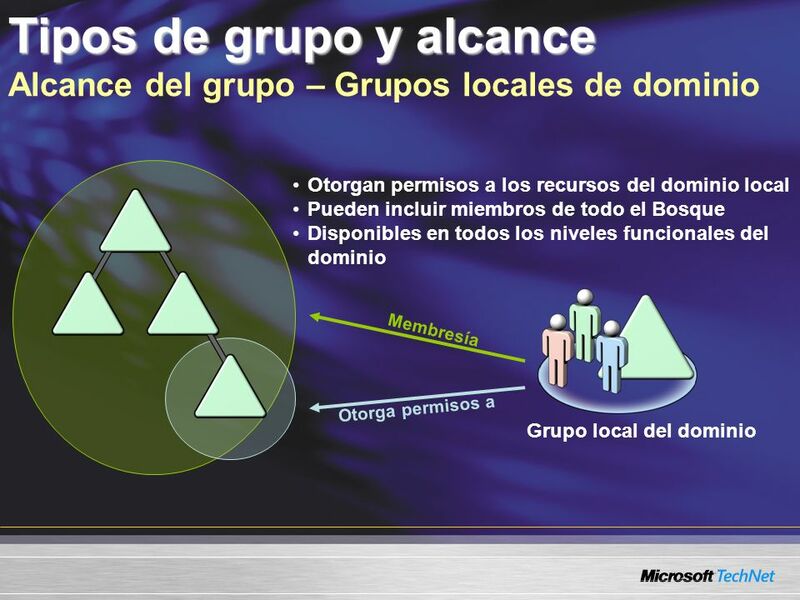 KEY MESSAGE: Explain group nesting. 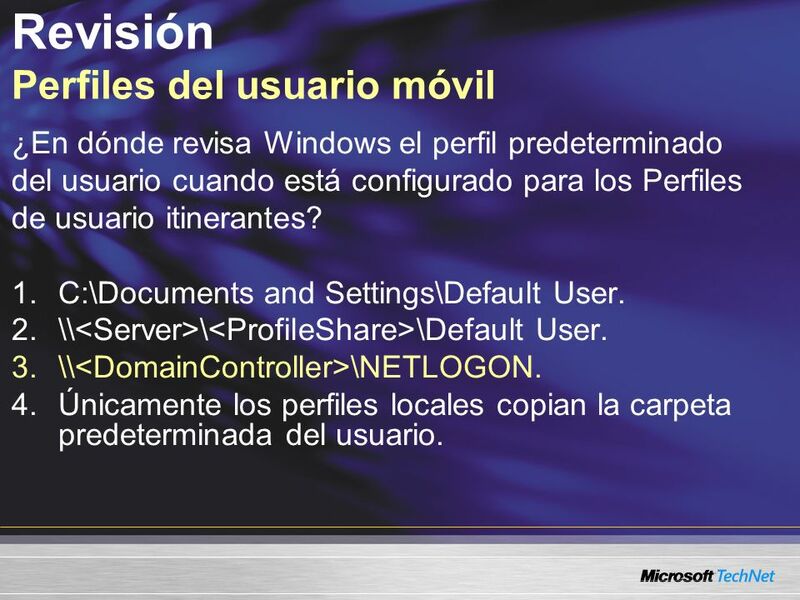 SLIDE BUILDS: 5 SLIDE SCRIPT: [BUILD1] In this example, let’s assume we have to assign permissions across two domains to various network shared folder and network printers. The marketing department spans two domains and you want to provide everybody in the marketing department to the network resources. 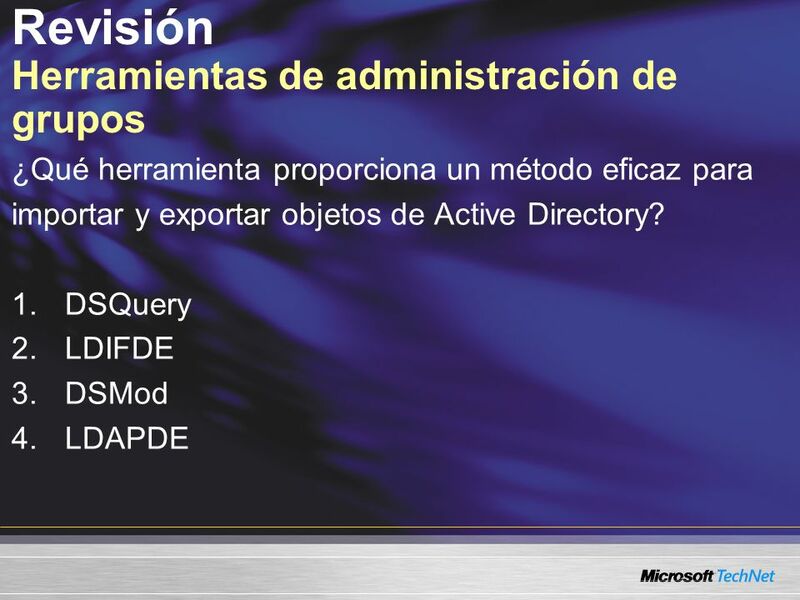 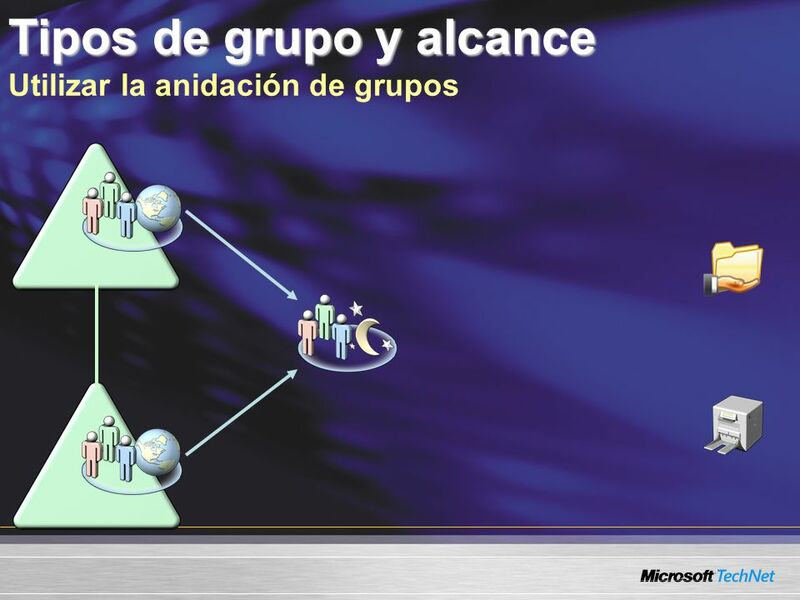 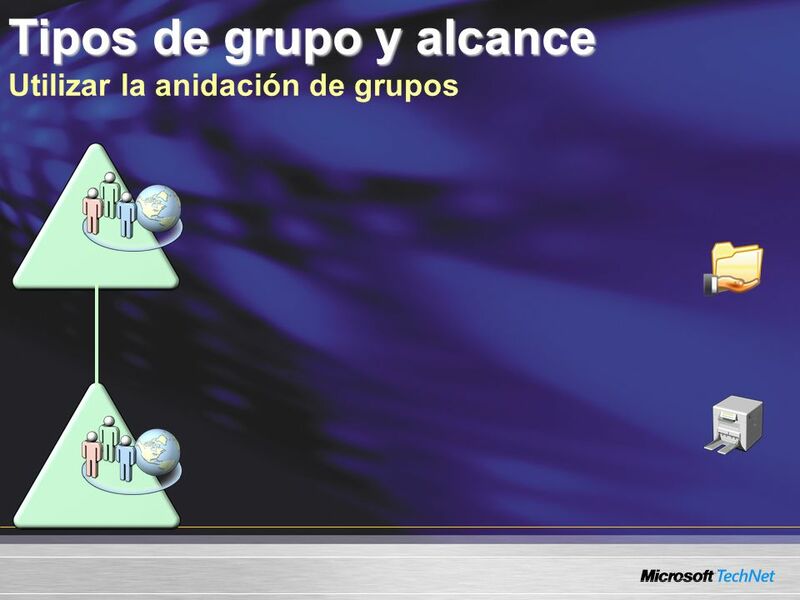 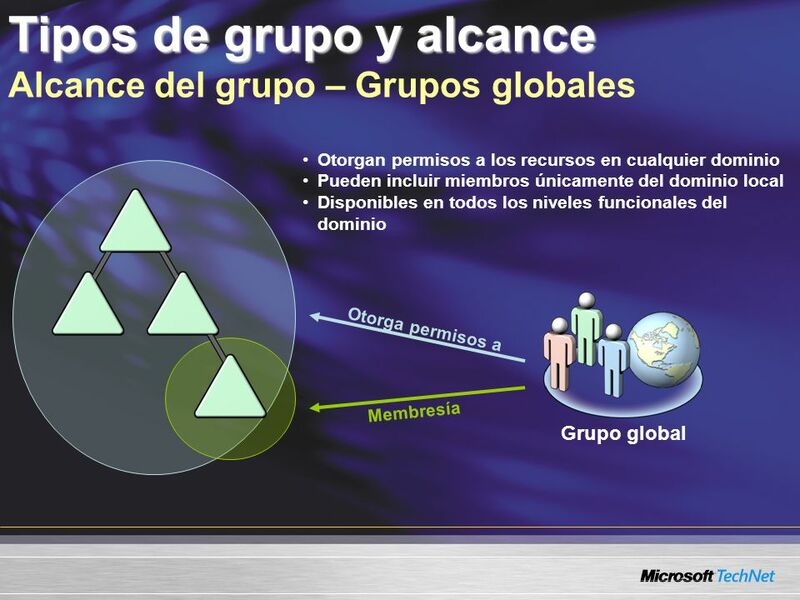 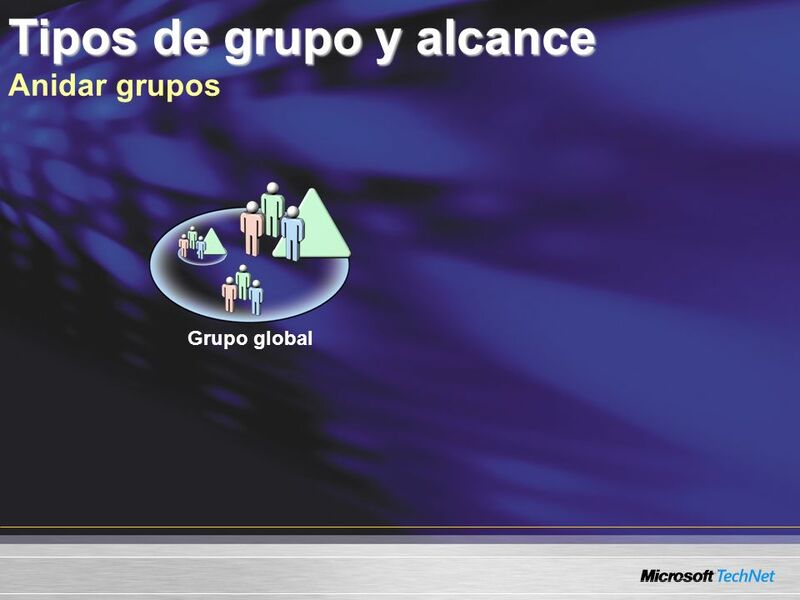 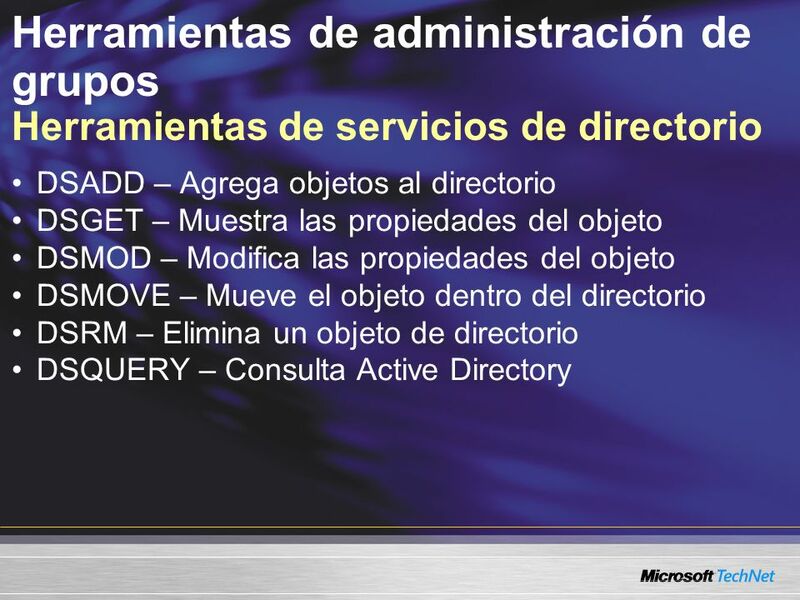 [BUILD2] As a rule, you will use Grupos globales to group together users and computers within one domain according to certain geographical, departmental, or functional criteria. 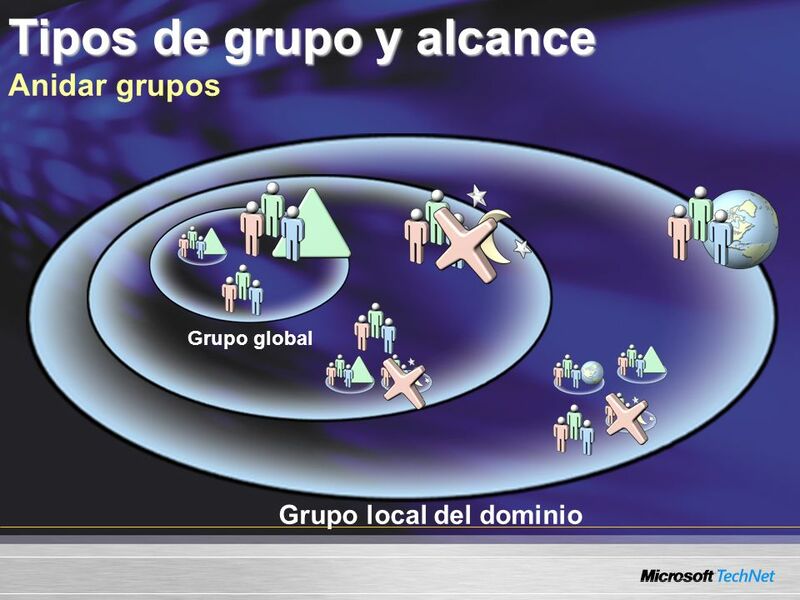 So in this example, we add all the users in the marketing department to the marketing Grupos global in each domain. 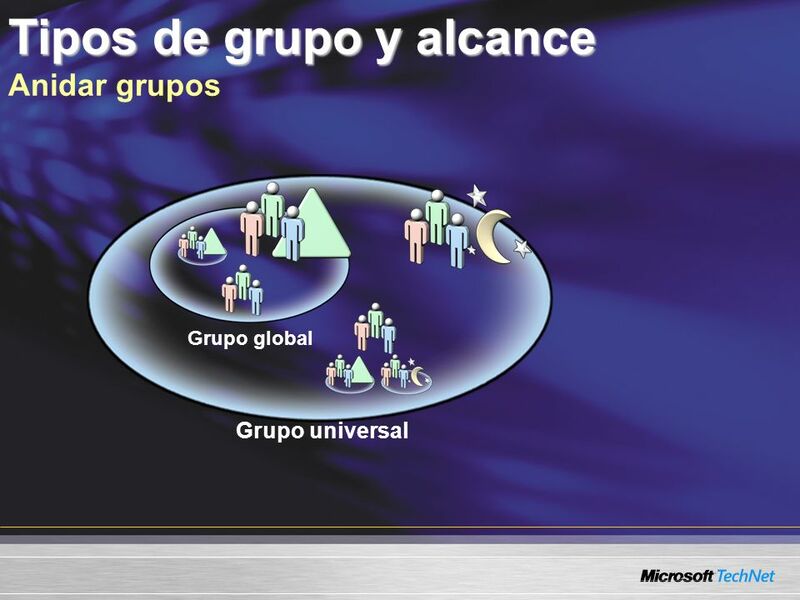 [BUILD3] To further consolidate these groups, we can optionally create a new Grupo universal that includes in it Membresía both of the domain Grupos globales. 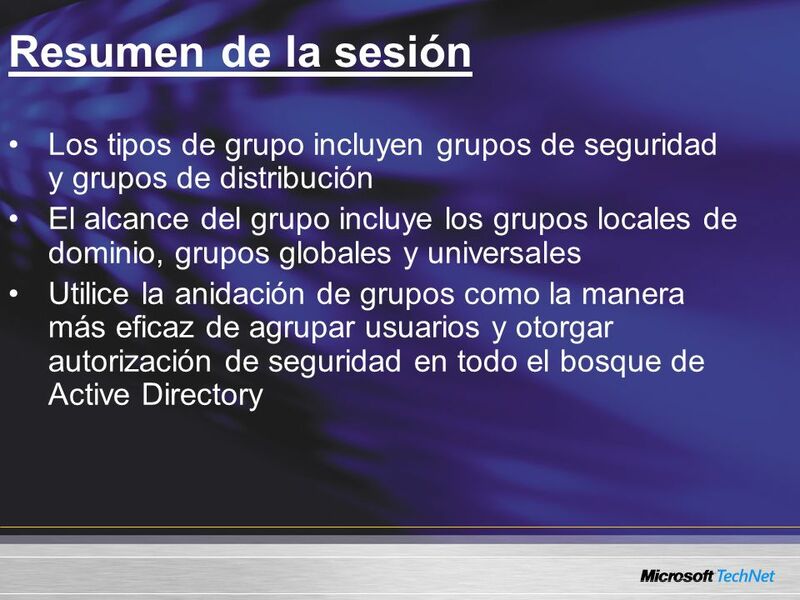 Remember the Grupo universal can include members from any domain to provide access to resources throughout the forest. 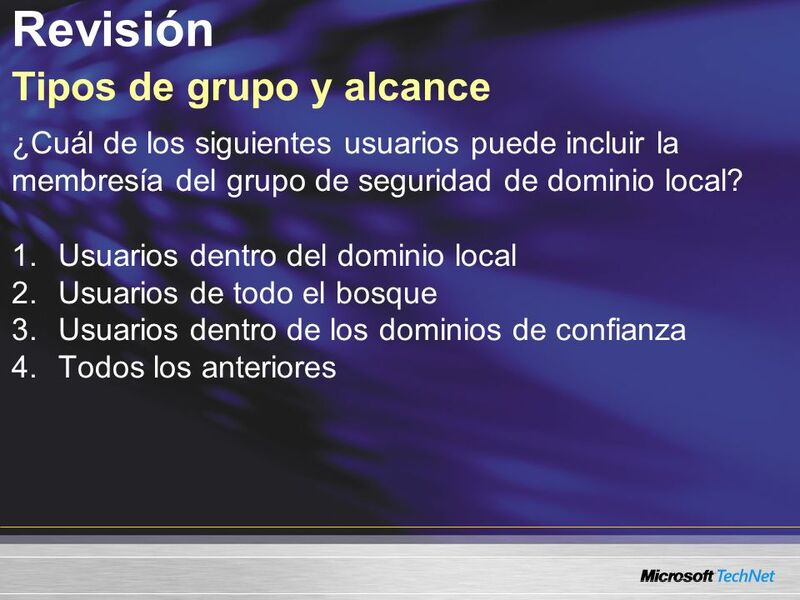 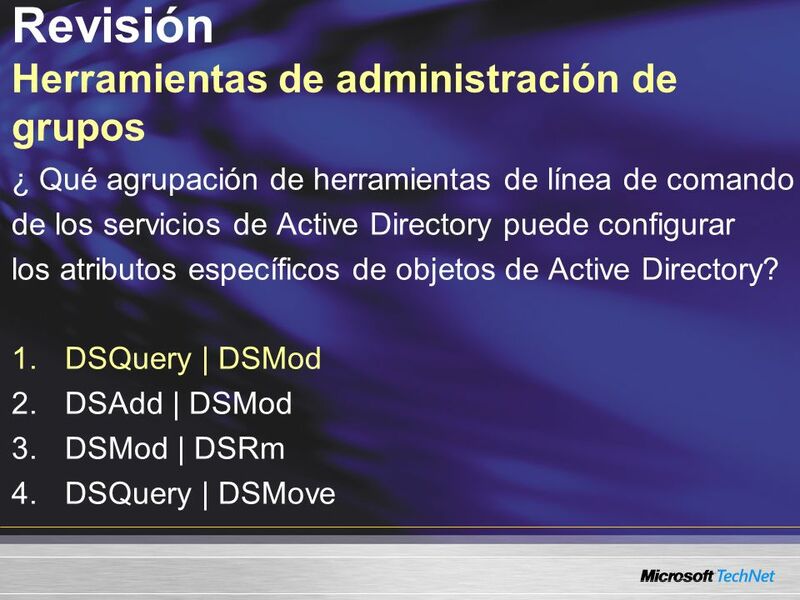 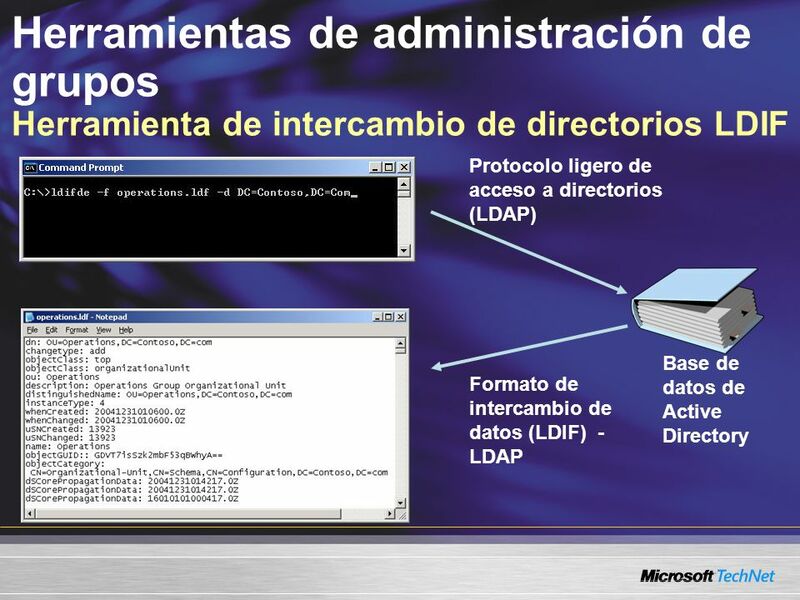 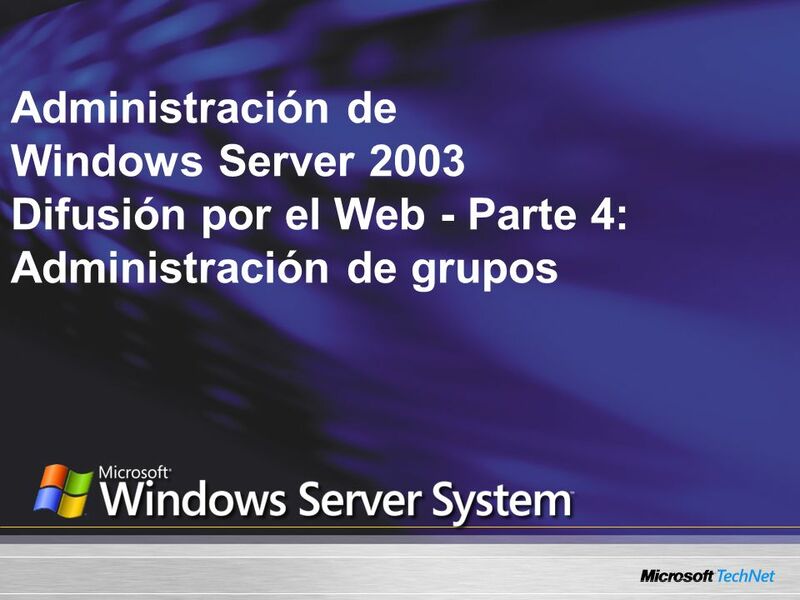 [BUILD4] Then, on the domain where the network resources reside, create a Grupo local del dominio and provide the security permissions to those resources. 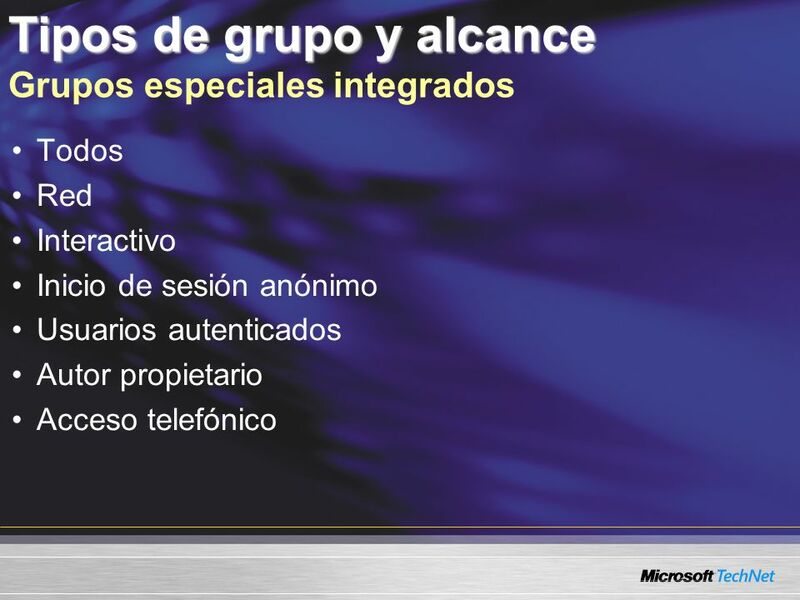 Todos Red Interactivo Inicio de sesión anónimo Usuarios autenticados Autor propietario Acceso telefónico KEY MESSAGE: Describe Grupos especiales integrados SLIDE BUILDS: 7 SLIDE SCRIPT: There are also some special groups called special identities, that are managed by the operating system. 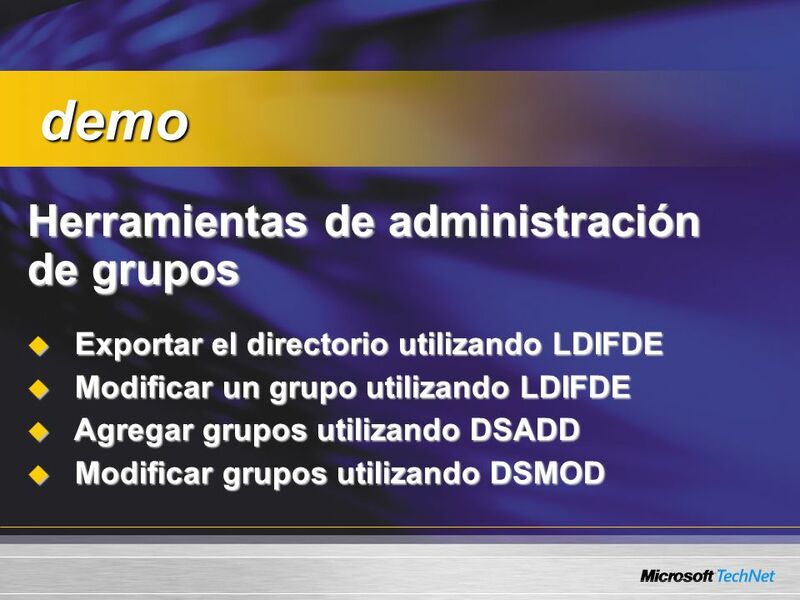 Special identities cannot be created or deleted; nor can their Membresía be modified by administrators. Special identities do not appear in the Active Directory Users And Computers snap-in or in any other computer management tool, but can be assigned permissions in an ACL. These special groups do not have specific memberships that can be modified, but they can represent different users at different times, depending on the circumstances. 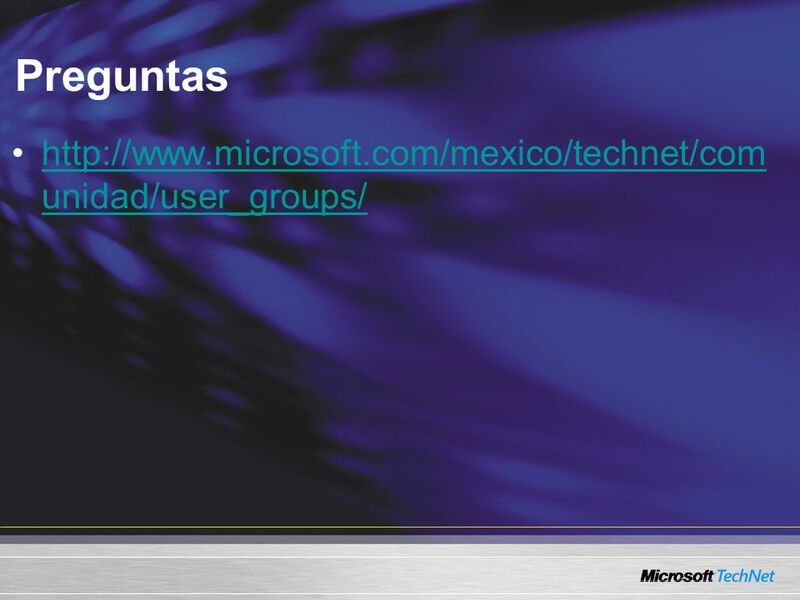 [BUILD1] Todos includes all current network users, including guests and users from other domains. 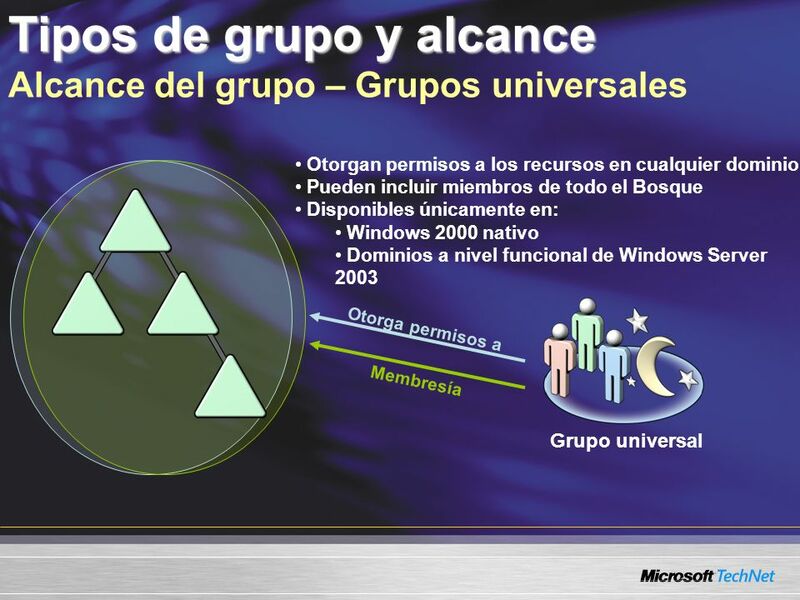 Whenever a user logs on to the network, that user is automatically added to the Todos group. 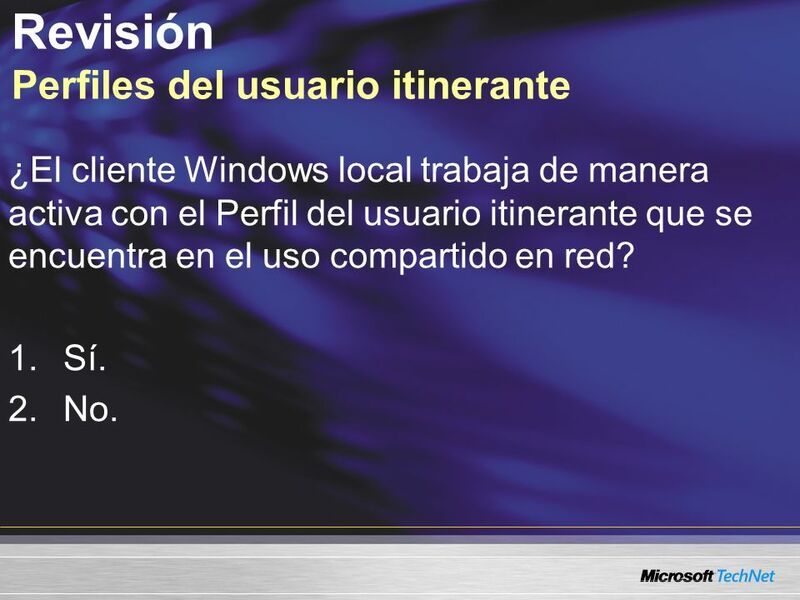 [BUILD2] Red represents users currently accessing a given resource over the network, as opposed to users who access a resource by logging on locally at the computer where the resource is located. 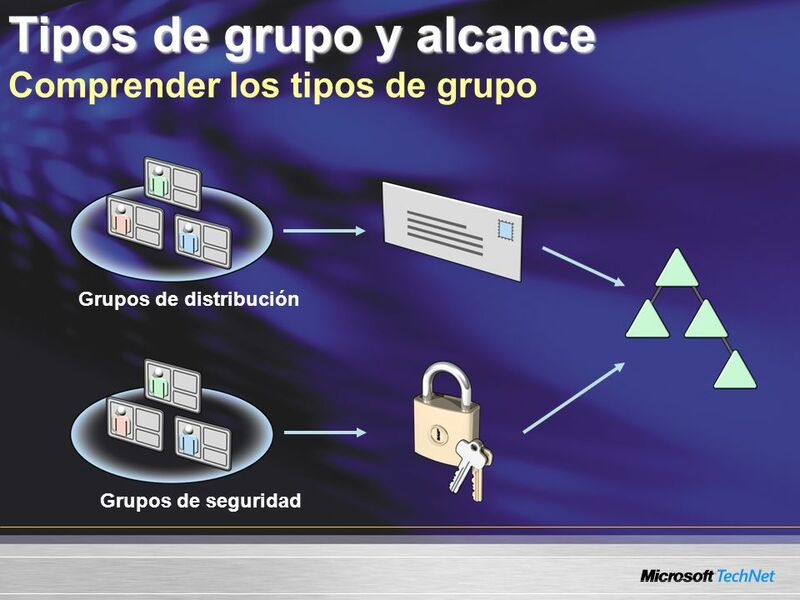 Whenever a user accesses a given resource over the network, the user is automatically added to the Red group. 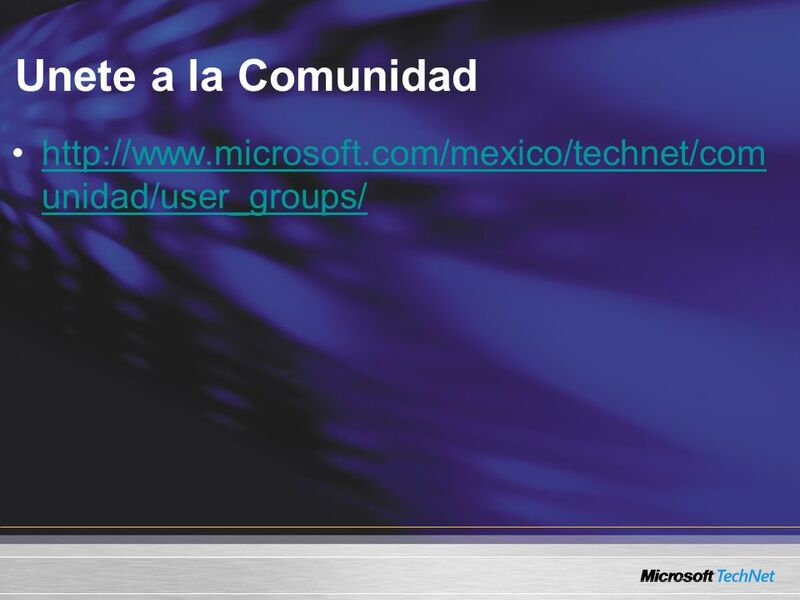 [BUILD3] The Interactivo group includes all users currently logged on to a particular computer and accessing a given resource located on that computer, as opposed to users who access the resource over the network. 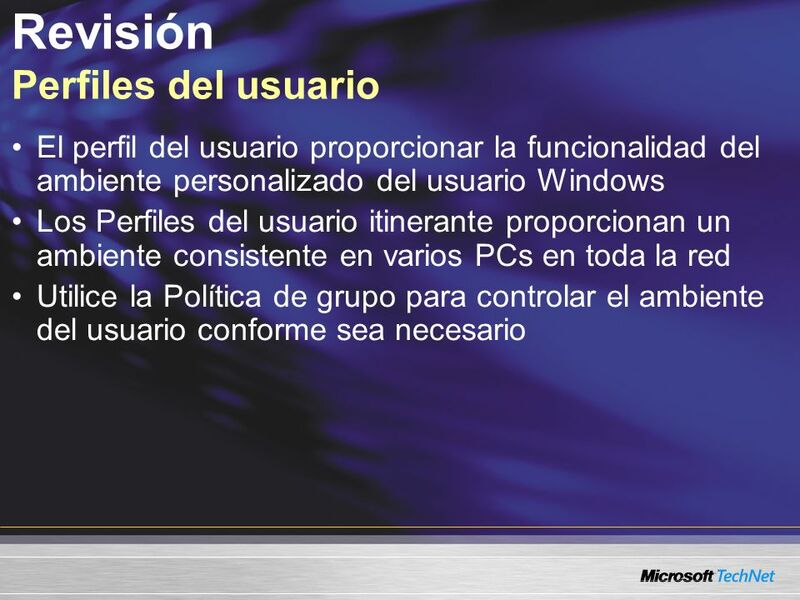 Whenever a user accesses a given resource on the computer to which they are logged on, the user is automatically added to the Interactivo group. 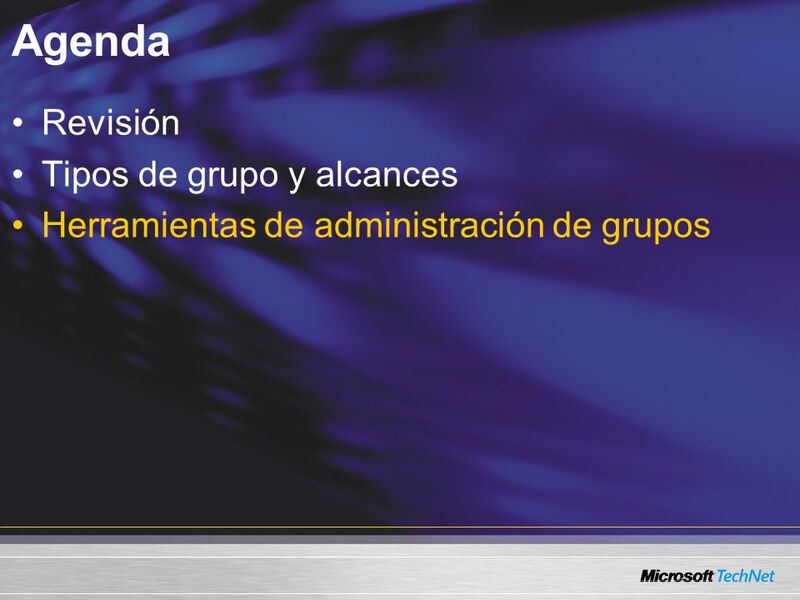 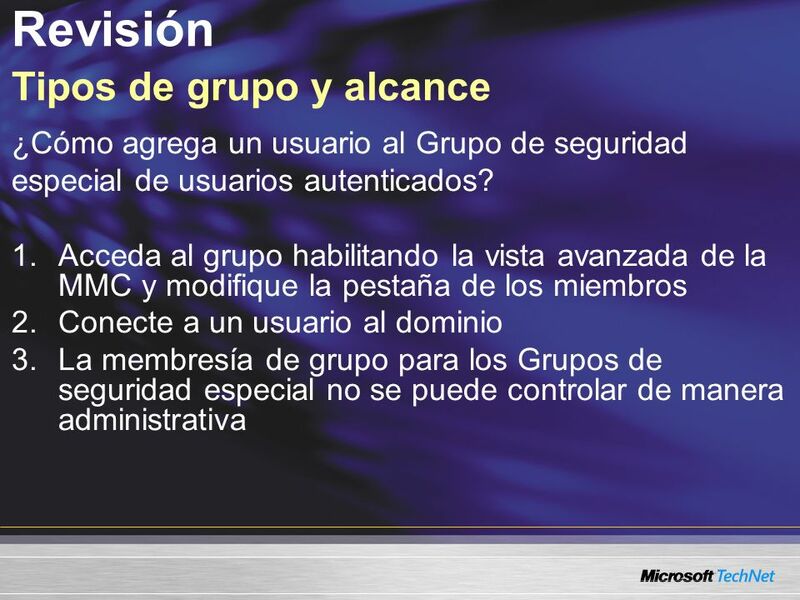 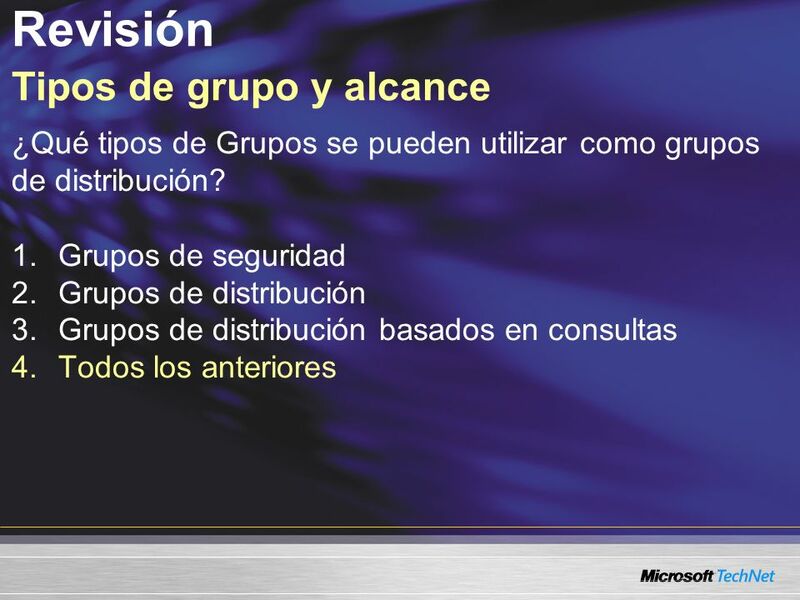 [BUILD4] The Inicio de sesión anónimo group refers to any user who is using network resources, but did not go through the authentication process. 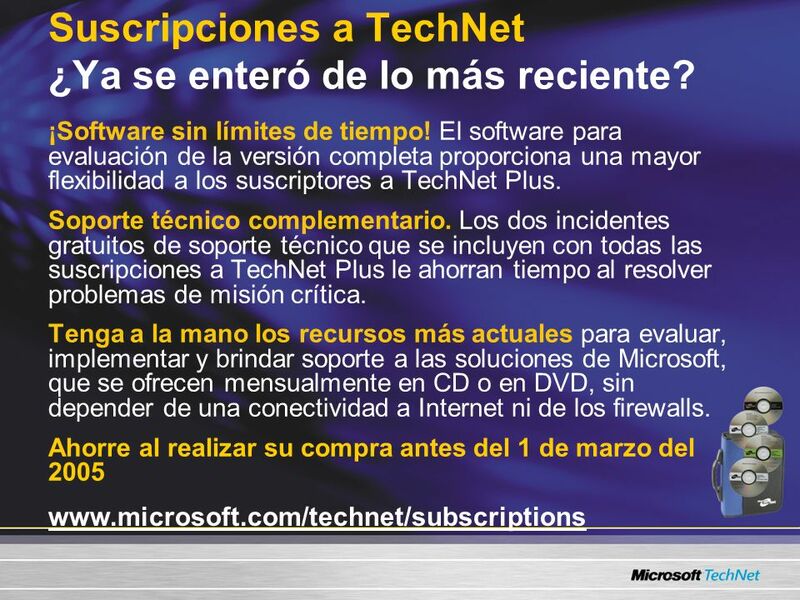 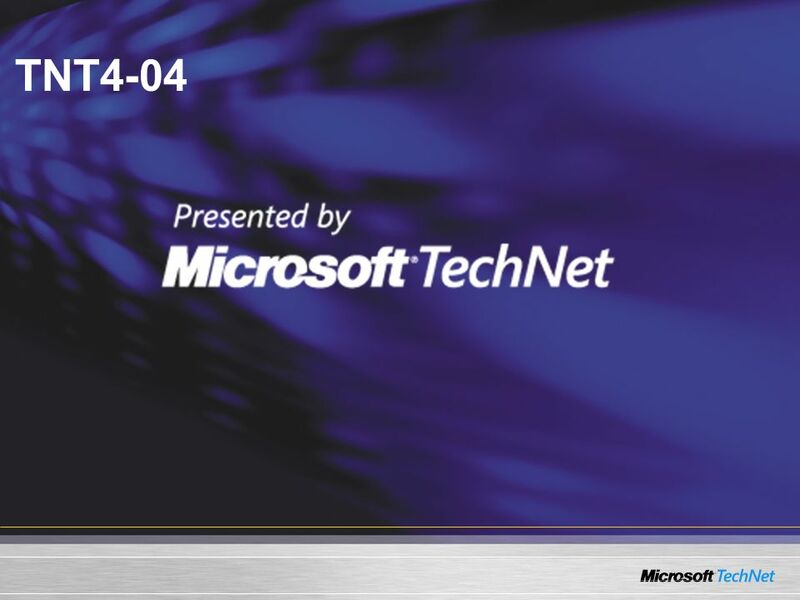 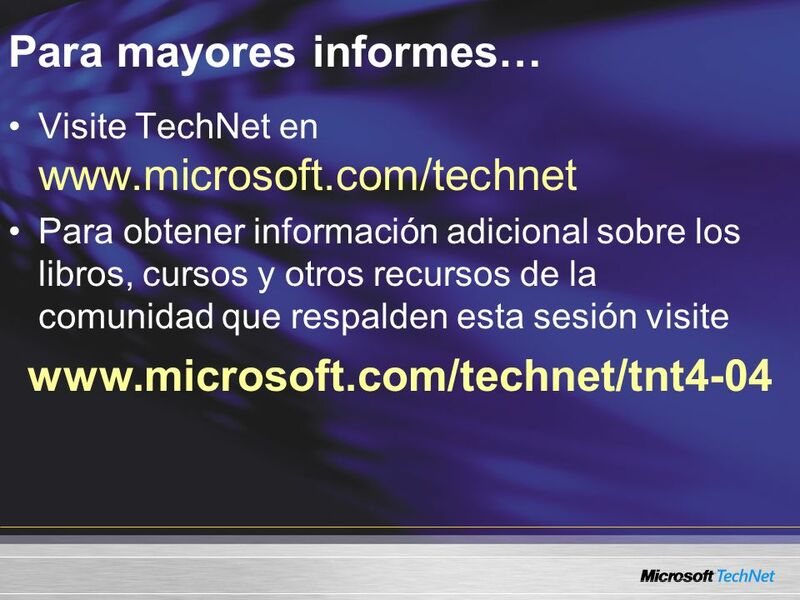 59 Suscripciones a TechNet ¿Ya se enteró de lo más reciente? 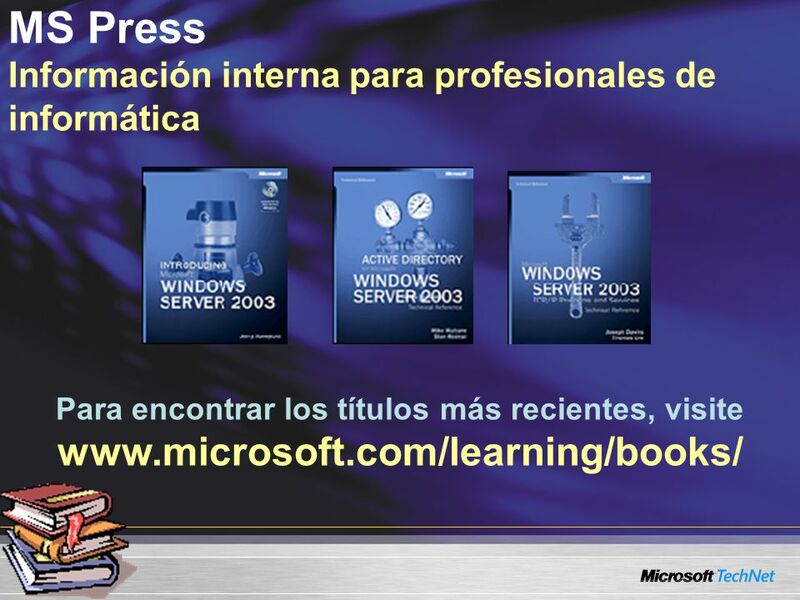 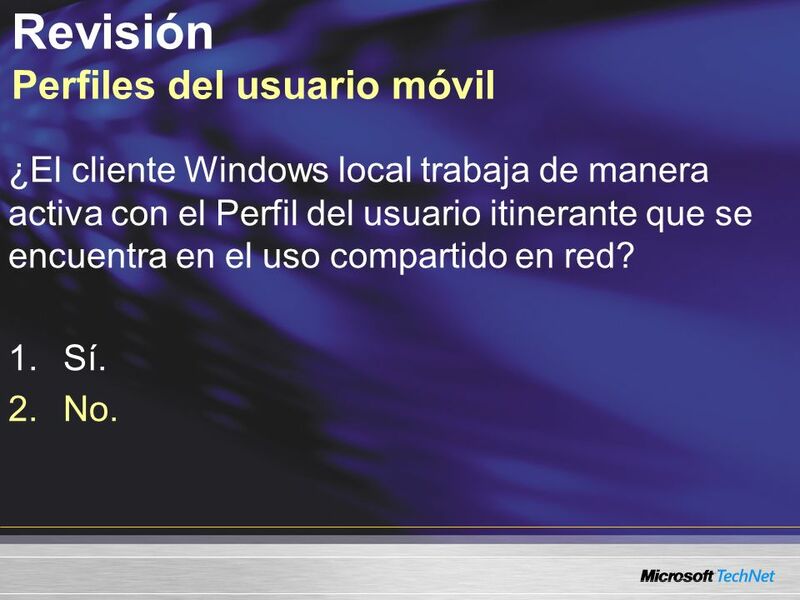 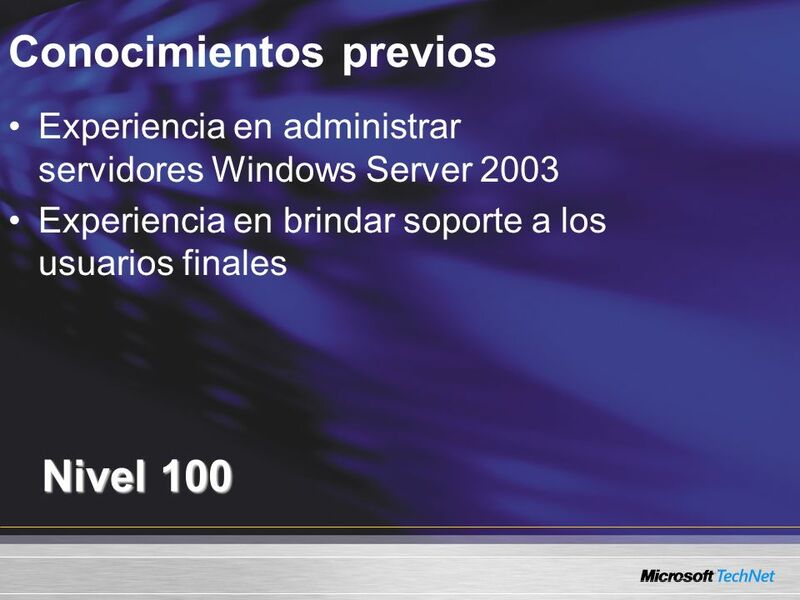 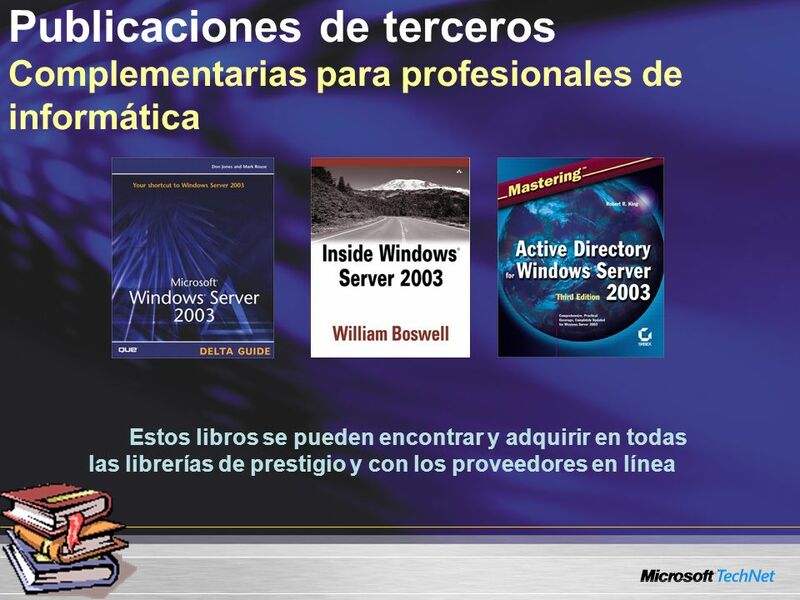 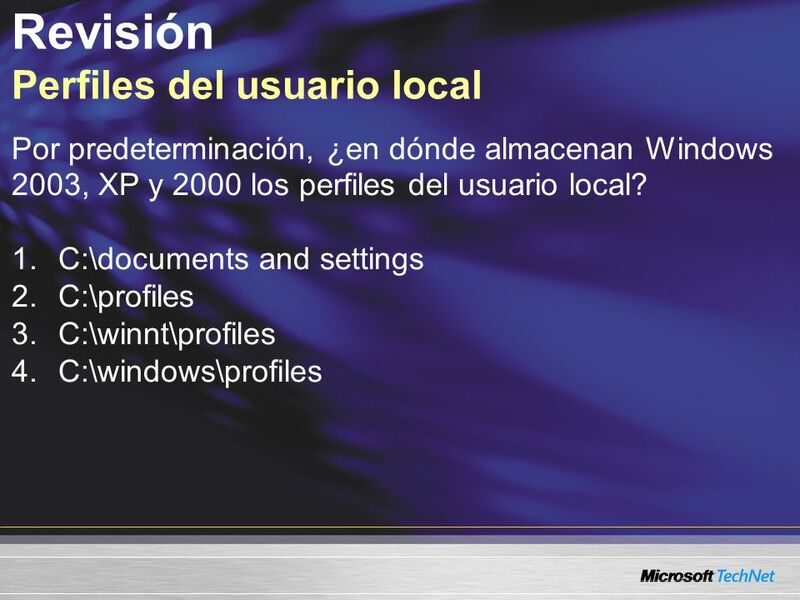 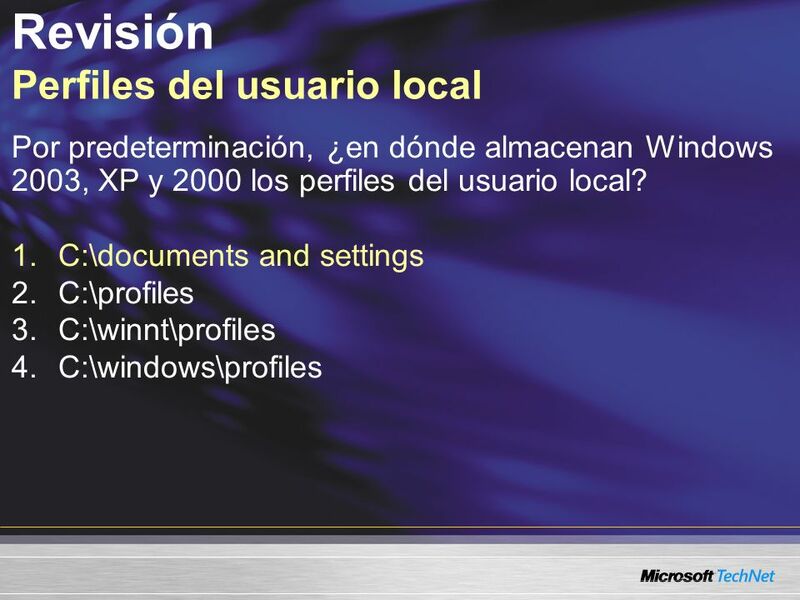 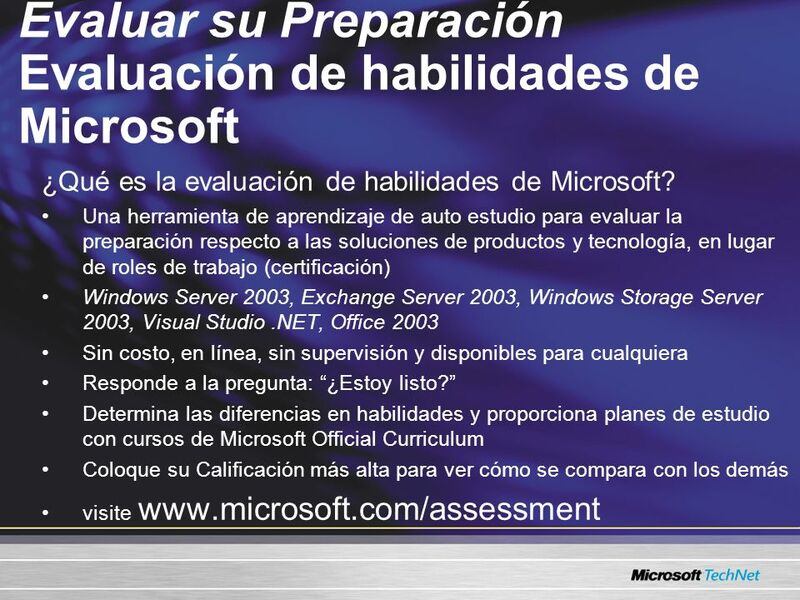 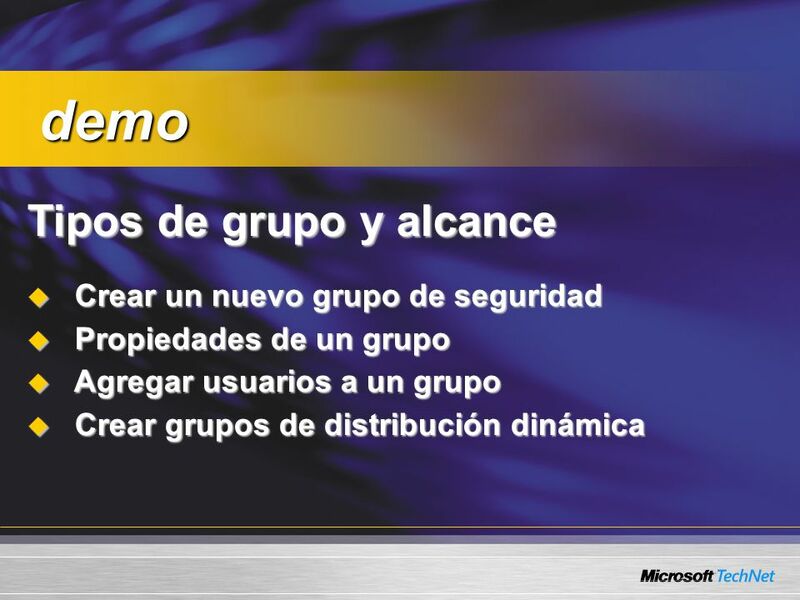 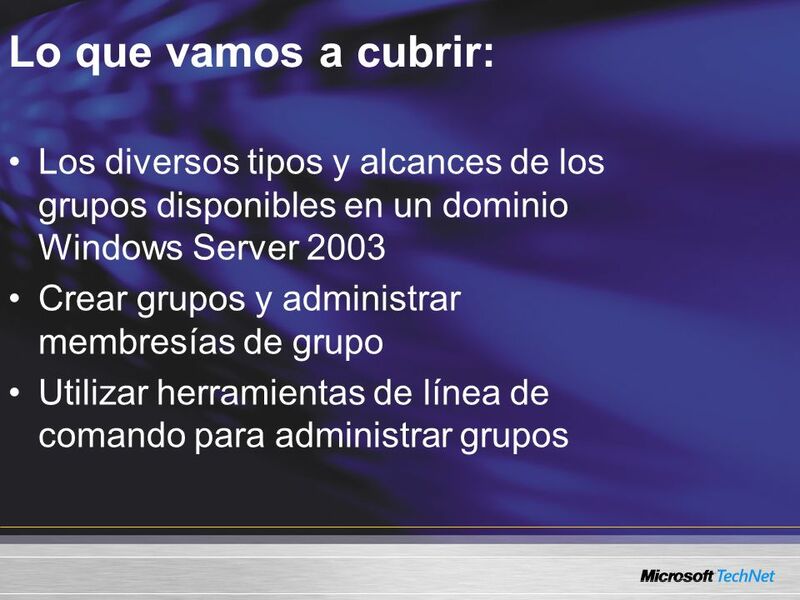 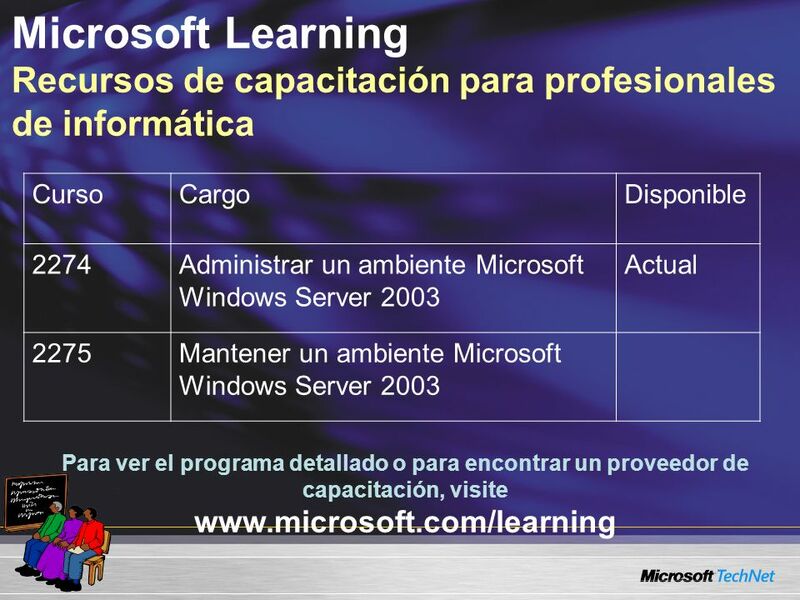 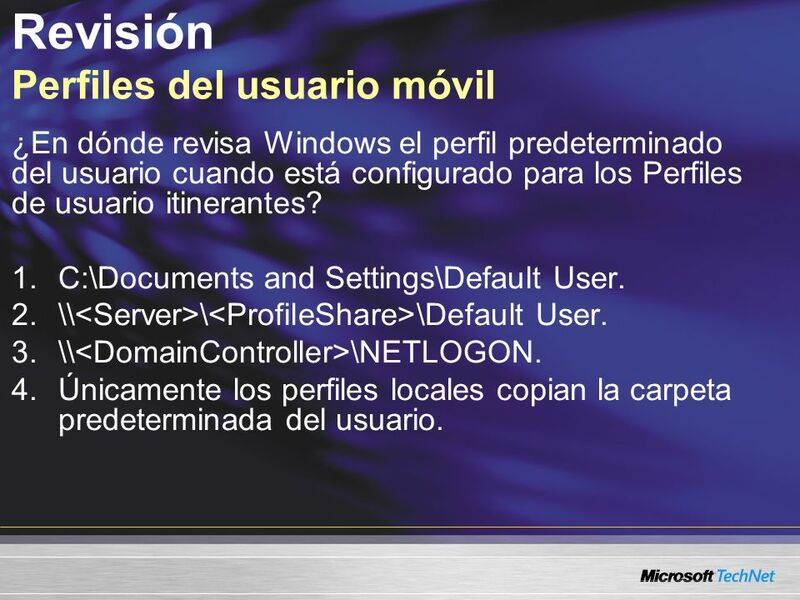 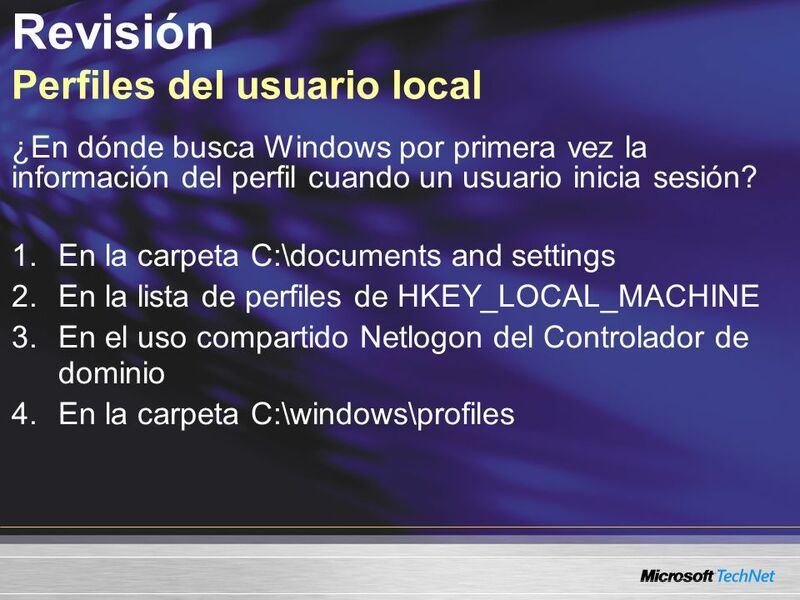 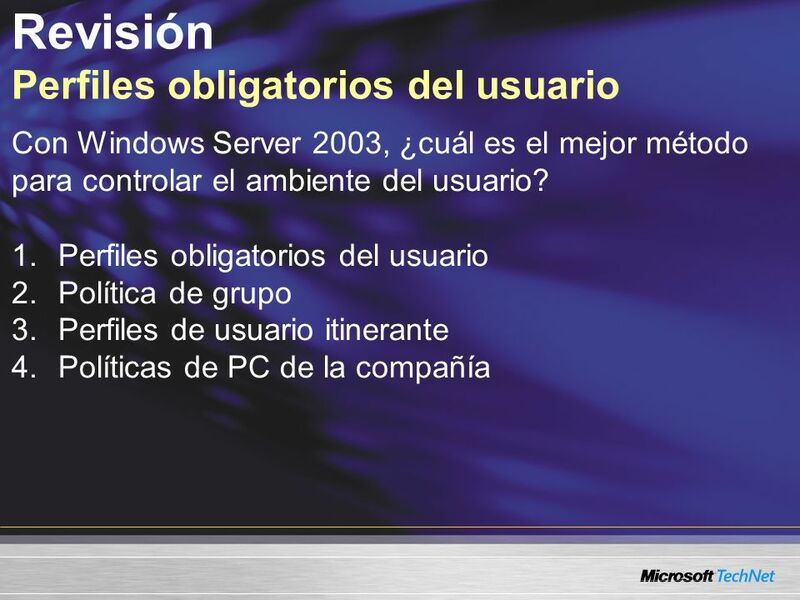 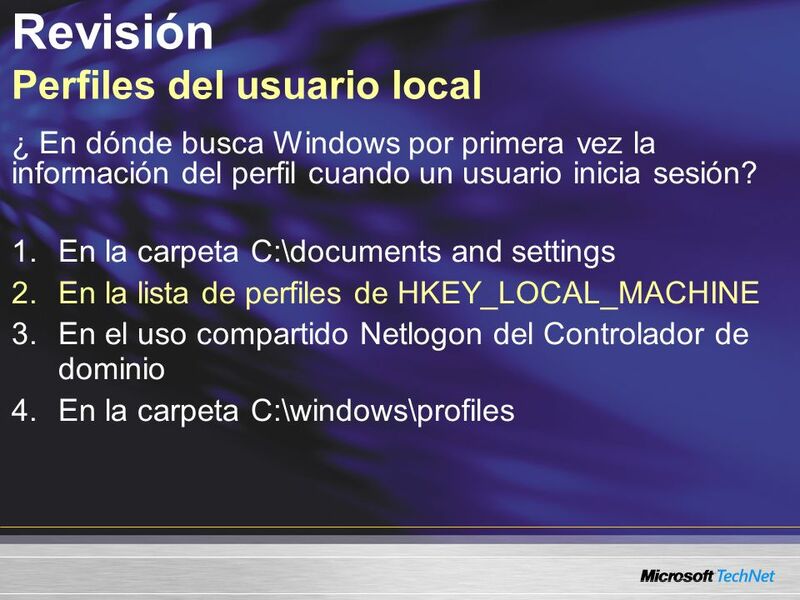 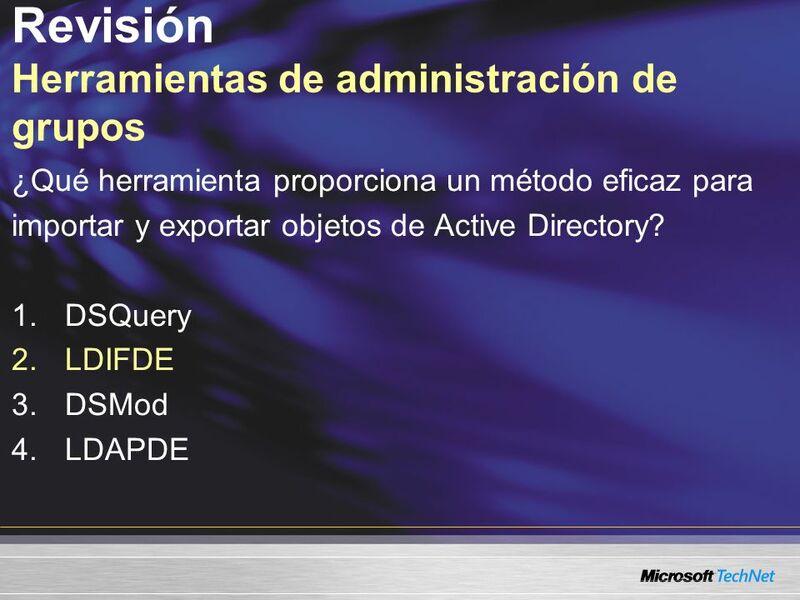 Descargar ppt "TNT4-04 KEY MESSAGE: Entry Slide SLIDE BUILDS: 0 SLIDE SCRIPT:"